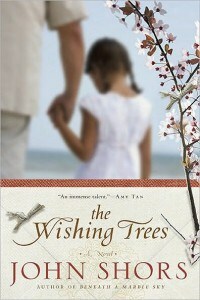 The Wishing Trees by John Shors is a novel about the overwhelming love that can be shared between a father and his daughter. After the death of his wife, the grieving Ian and his 10 year old daughter, Mattie receive a special letter that implores them to travel to Asia to learn how to live and love again. Along the way, the two tie paper wishes to trees as messages to their beloved wife/mother while they attempt to accept her loss and reconnect with one another. As the mother of three young children who are my entire world, I felt my stomach lurch at the reality that no matter how much I love my children the day may come when I am forced to leave them prematurely and the possibility is emotionally painful to me. The author brilliantly writes from the perspective of a spouse and child coping with overwhelming grief and sorrow of their loss. Their pain is palatable and the message of enduring love and healing was very inspirational and moving. The Wishing Trees was a beautiful novel that really made me examine my own life and family and is one story that I can give my highest recommendation. Want to Be the First to Know About the Next Boost Your Buzz Giveaway?